Today it’s World Bread Day!!!! I consider focaccia a type of flat bread, as it is the way I eat it most of the time: if I have friends coming over and I do not have fresh bread, I knead a focaccia (my Kenwood chef knead a focaccia, to be precise), and the appetizers are saved! Dissolve yeast with sugar and warm water. Add flours and salt, and knead. Let it rise or at least 1 hour or until it doubled its volume. Lay it in an generously oiled oven proof dish and let it rise again. Preheat the oven at maximum, sprinkle focaccia with sumc and bake until golden. @Jep: don’t be challenged! I was and with a bit of courage, everything went fine!!! Adoro il sumac e la focaccia non l’avevo ancora assaggiata! Looks delicious. 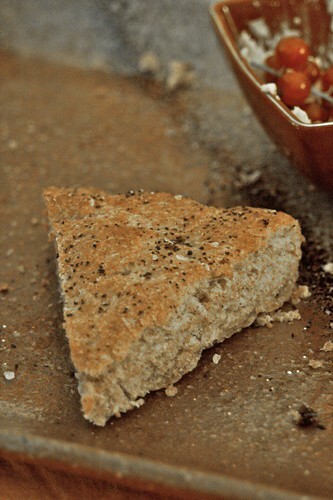 Great idea to do it with wholegrain flour. me ne ero dimenticata Sara!! P.s. manchiamo all’appello incontri da un pò!! Ma voi un giretto a torino, non lo fate mai?